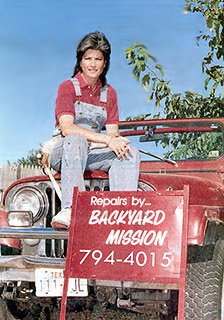 Backyard Mission was founded by Laurie Foster in September of 1992. Laurie was raised in Arlington, Texas and graduated from Texas Tech University in Lubbock, Texas in 1983. After teaching public school for eight years, she followed God's call to serve in the mission field — which ended up being in her own backyard. Her heart for mission work began when, as a high school student, she took a mission trip to Appalachia to repair homes for impoverished families. 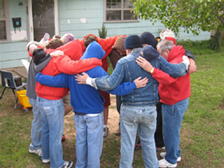 Backyard Mission is simply local mission work. 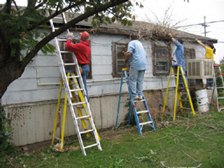 Backyard Mission roofed its first home in September of 1992, and has been repairing homes and sharing the love of Jesus ever since. Their mission is to provide free home repairs for low income and elderly in Lubbock. Repairs focus on getting a home warm and dry. The work is done with volunteers and materials are brought with donated funds. Typical repairs include: roofing, siding, painting, windows, doors, heaters, water heaters, ramps, and simple plumbing repairs. Volunteers come from a variety of sources: churches, civic groups, college groups, youth groups, businesses, and professionals. Along with ministering to the citizens of Lubbock, Backyard Mission helps other towns start programs. Laurie puts on workshops and speaks to churches about the program to help them get started.The parable of Matthew 25:31-46 is the foundation for Backyard Mission. Laurie believes our strongest mission as Christians is to demonstrate God's love by meeting the needs of our neighbors. Few people go into full-time foreign mission work; so the rest of God's people need to be in ministry where we live and work, in our everyday lives. Each of us is called to live out our part of the body of Christ on earth”.